Part 1 and Part 2 are the study of a variety of literary text types from a variety of sources. This requires a lot of initial preparation. Part 3 looks at the contexts within which texts are written and received. You will read one work from the Prescribed Literature in Translations (PLT), one work that is the school’s free choice and one work from the Prescribed List of authors (PLA). Part 4 looks at detailed analysis of literature works. You will read 3 works in this section. 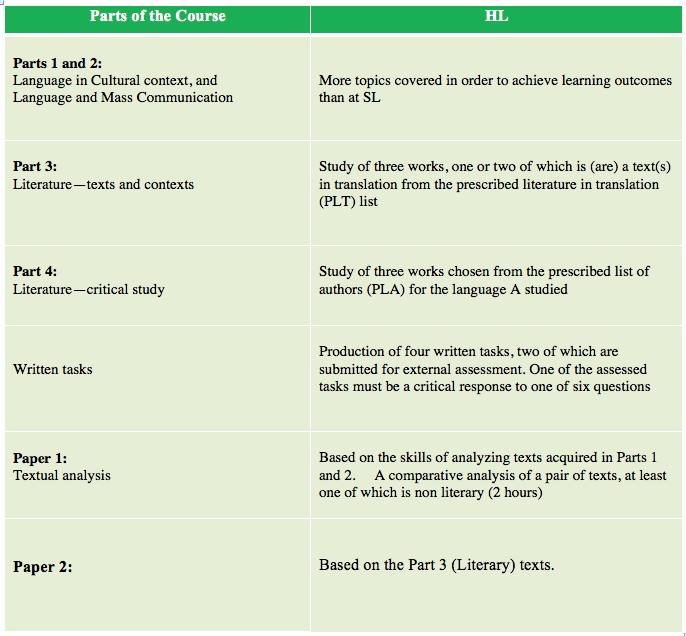 Paper 1 is based on the skills of analyzing texts that you develop in Parts 1 and 2. Paper 2 is based on the part three, literary texts. The recorded Individual Oral Commentary is based on the Part 4 Literary Texts. The Further Oral Activity based on Part 1 or Part 2. All of you must maintain a portfolio of Written Tasks, which are based on all parts of the course. The first type of Written Task (WT 1) is an imaginative piece in which you demonstrate your understanding of the course material by writing a text type other than an essay. Besides these creative pieces, you also write critical responses to the texts you have studied in class in light of one of six prescribed questions. These critical responses are as Written Task 2. You will submit 2 Tasks: one based on parts 1 or 2, the other based on parts 3 or 4. One should be a Written Task type 1, the other is a Written Task type 2. If Written Task 1 is based on Parts 1 or 2, then the Written Task 2 must be based on Parts 3 or 4. If Written task 2 is based on Parts 1 or 2, then Written Task 1 must be based on Parts 3 or 4.